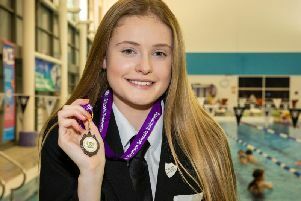 There was success for Law and District Athletics club at Glasgow’s Emirates Arena over the weekend, with medals aplenty at the Scottish Indoor National Championships. Under 15 Oscar Logan (pictured above), from Motherwell, achieved a Championship record in the 800 metres – winning gold in a fantastic personal best time of just under 2 mins 3 seconds. Although the 2019 season has just started, this record time takes him to second ranked in the United Kingdom for indoor 800m and first in Scotland. Oscar’s next major event is the English Indoor Championships in Sheffield on February 23. Under 13 Euan Blackwood, also from Motherwell, achieved bronze in the 60 metre sprint with a new and impressive personal best time of 8.43 seconds. There were more medals, this time being won by athletes from Clydesdale, with under 20 James McClafferty, of Lanark, winning bronze in the 400 metres with a personal best indoor time of 50.20 seconds. Under 15 Calvin Simpson, from Biggar, continued to excel in the 4kg shot put, winning bronze with a new personal best throw of 11.18 metres. 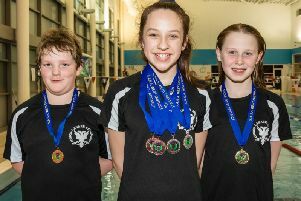 A hugely successful weekend in Glasgow for the club, with athletes from Carluke and the surrounding area once again excelling on the national stage. Meanwhile, at the other end of the country in Exeter, two Law & District AAC athletes competed in the BUCS British Universities & Colleges Sport) cross country championships on Saturday, February 2. Under 20 James Gillon, respresenting St Mary’s University in London, had yet another outstanding performance, completing 8.2 kilometres in 27.04 minutes and finishing in 21st place in a field of 522 athletes. Under 23 Emily McNicol, representing Strathclyde University, also completed her race in a time of 27.04 seconds but over 6.2 kilometres, finishing in 266th place in a competitive field of 644 athletes.